View Hendrix Drums' current list of retailers and find where you can get your hands on some SLEEVED WASHERS. There are many benefits to upgrading to SLEEVED WASHERS. See why tens of thousands of these have already sold to drummers around the world. 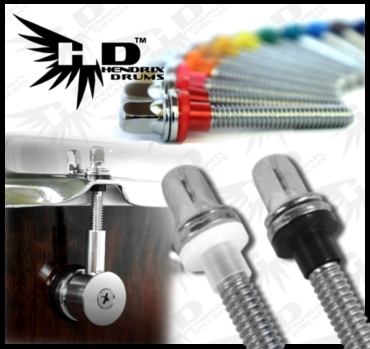 Join many of the top drum shops around the world and carry SLEEVED WASHERS in your store. "I spent less time tuning my drums on tour after I started using these washers"
"Excellent Design, as a custom builder, these will go on all of my drums!" "These little washers dont look like they will make a difference but they do!" " I would recommend these to any drummer. No doubt that these will be on all my drums from now on"
"These colored rod washers are very cool. Gives the drum an extra PIZAZZZZZZZ." Copyright © Hendrix Drums, Privacy Statement Terms and Conditions.